I’m in the final stages of my project to construct a Hebridean wind vane self steering system. I brought the pendulum home to Cambridge so that I could work on shaping it into the computer-generated profile recommended by John Fleming in his plans. You may recall that earlier I made a template from the plans out of a piece of thin plywood. 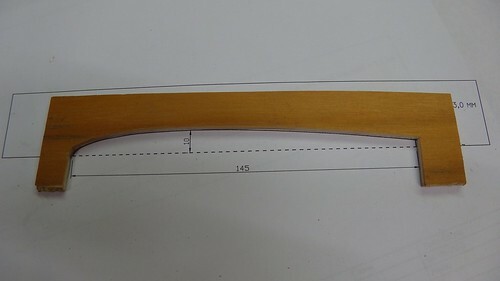 I also experimented with using a router to get the basic shape of the profile, then planing to finish the job. 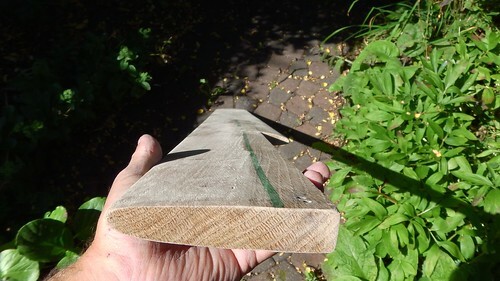 I would have continued with this technique, but I don’t have a router or any other suitable power tools in Cambridge. 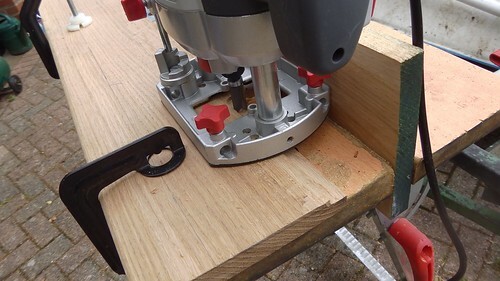 I did look in to using a CNC router at Makespace to get a perfect profile, but in the end I just went to Mackays and bought a plane and sharpening stone (things I wanted anyway) and did the job by hand on my dining room table. I started by getting the bottom end of the pendulum into the correct shape. This end is going to be cut off since the pendulum is way too long for Tammy Norie, so I could afford to get into practice. 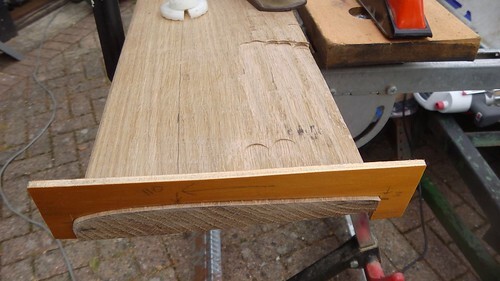 I applied greatest pressure with the plane at this point and eased off towards the top, so that less wood was removed. I then moved up the pendulum, using the template as a guide. 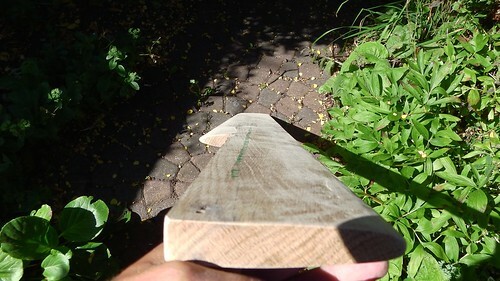 This gradually copied the shape from the bottom end up along the whole plank. To fine tune the shape, I used a marker pen to mark where the template was touching the surface. It was then easy to plane away the mark and take another look. This gradually corrected the profile over the whole pendulum. I did about three hours of planing last night and another two this morning, followed by about 30 minutes of sanding, with this result. It’s very close. There are some minor wobbles that I’ll correct, but I think the job is done. So I’d say allow six hours for planing your pendulum. 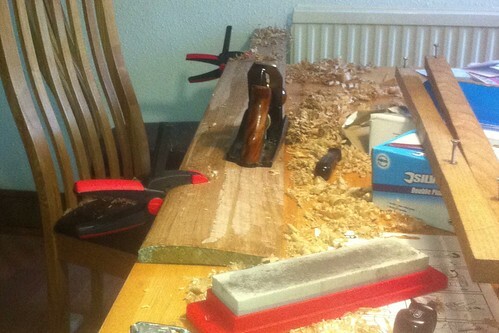 I had to sharpen the plane about once per hour, and especially when it was new. This video on how to sharpen a plane was very helpful, and allowed me to get a very good cutting edge. 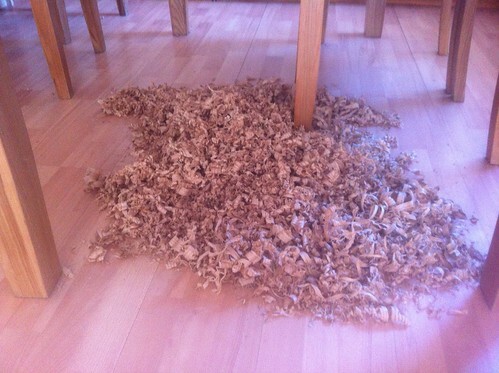 I’m also left with about a third-of-a-plank’s worth of oak shavings! Hang on to those shavings – you need them to properly smoke your mackrels whilst underway. Hi Richard, really enjoyed reading your blog posts! I was part of the reason that you didn’t get replies from John Fleming as I was sailing with him from Skye to Lerwick on his boat Sleepy Eagle. It was an incredible passage and learning about the wind vane design was fantastic too, so it has since been wonderful to read your blog about how it was made. Thank you Leanne. I can’t watch videos out here in the North Sea but I’ll certainly take a look when I can. I’m writing to you as the Hebridean is reliably steering me on a dead run in a force 3, so it’s really working well, even with my slightly weird configuration. John has been very helpful and patient. Fantastic! I’m glad to hear it. Let me know if you like the video. Oh and my friend Oliver said that he’s a friend of yours too from CUYC! It’s great when you find these connections between people isn’t it! I managed to watch the video on WiFi in port and I liked it a lot. Nicely made!